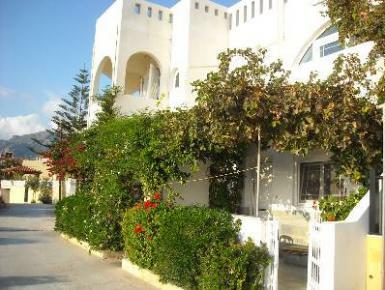 Ikaros villa is located at the beach, only 30m of the sea. Of the apartment you can have a spectacular view to the Libyan sea. Ikaros villa is a family complex and it is located on the beautiful village of Makri Gialos at Kalamokanias beach at eastern southern part of Crete. Ikaros villa 1 is located on the first floor. Of the balcony, you can have an irressistible view of the sea. The apartment consists itself of 2 bedrooms, 1 living room with full equipped kitchen, 1 full bath with bathtub, 1 WC and furnished balcony. In each room, there is air-conditioning. A sat-elite T.V is available and Wi-Fi internet too. Here you can spend relaxing holidays by the sea and enjoyable sightseeing. Makrys Gialos is a small traditional fishing village, with a variety of beaches with blue crystal water in the eastern-southern part of Crete .